This is a crazy bunch of everything lovely! 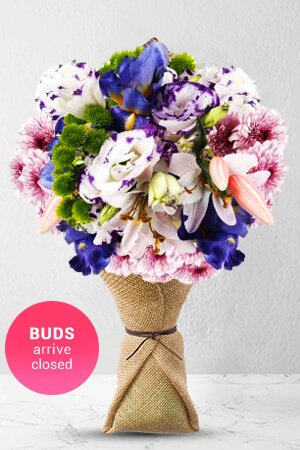 Blue Iris, mixed Eustoma, an exotic Tiger Lily and Chrysanthemums make this an exuberant burst that is sure to delight your special someone.Vase not included. However, we suggest including a Premium Vase with your gift to make it that much more zany. Lilies may be sent closed/partially closed in order to prevent damage and to last longer. The flowers were delivered within approx 6 hours of ordering and the recipient was delighted. Was delivered within hours of placing the order and the recipient loved them!